Topics: Art Market/services, Wilhelm Lehmbruck, Erich Heckel, Alfred Kubin, and Aristide Maillol. Its 2 nameservers are ns2.serverkompetenz.de, and ns.serverkompetenz.de. 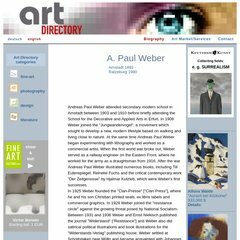 A-paul-weber.com's server IP number is 81.169.162.159. Strato Rechenzentrum Berlin (Berlin, Berlin) is the location of the Apache/2 server. PING www. (81.169.162.159) 56(84) bytes of data.